Holiday.gr - Apollonia, a trip to a myth! Apollonia or Stavri, as the locals call it, is the capital of the island. It is built amphitheatrically on three hills, almost in the center of the island. Walking in the cobblestone paths, you will be impressed by its traditional architecture. Uniformity of structures, churches and small squares create a harmonious group. In the shops you will find unique items of traditional art. Don’t miss buying ceramic items and decorations. Pottery is an art with long history in the island. You will see that from the exquisite quality of ceramics and variety of designs you will find in the shops and workshops. Apollonia is the command and trade center of Sifnos, inhabited since archaic times. In the same spot was built the ancient homonym town. As it seems from her name, Apollo, the god of light, (Apollonia means city dedicated in the worship of Apollo) was worshipped there. Denomination Stavris is due to the geographical position of the city, as it is a compulsory crossroad to all directions. While staying in the city visit the Folklore museum and the church of Panagia Ouranofora, with the gold-filled chancel screen and the rare icons. On the hill of Prophet Elia, the highest top of the island, is built the homonym monastery. It was built during the 12th century. 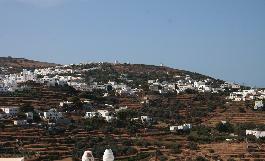 It is worth visiting and admire the priceless religious heirlooms and a beautiful view of Sifnos. It is the most beautiful natural balcony of the island. The panoramic view enchants every visitor. Apollonia is famous for her nightlife. Bars and clubs with live music, promise unforgettable moments. In the taverns you will taste local recipes and in the patisseries delicious sweets. In the city you will find hotels and rooms to let, providing their guests all comforts. From Apollonia leave buses to the villages and beaches of The island. Been to Apollonia ? Share your experiences!